My links to the THM store will take you to the main page and you can shop under the THM products link in the middle of the page for the book, sweeteners, baking blend, etc from there. Thanks for stopping by, and let me know how you like these versions of GGMS! I am following Trim Healthy Mama guidelines for about half of our meals, and one thing I really enjoy is the Good Girl Moonshine!! It's a drink you can sip on all day long. The more the better! I make my usual GGMS with several basics. First, start with filtered water. Fill a glass about 3/4 full. Then I add a tablespoon of Braggs Apple Cider Vinegar (you want the unfiltered kind, with the mother in it), lemon or lime juice, and ginger. You can add stevia, xylitol, gentle sweet, or other on-plan sweeteners if you would like. I prefer it unsweetened. I usually make it in a quart size jar or glass, too. Last night I ran out of those jars so I used my pint sized ones too! I love to pull one out of the fridge and drink it while it's still super-cold and refreshing! For ease in preparation, I have a little ice cube tray that I use to make ACV cubes, citrus juice cube and ginger cubes. The ginger gets juiced (with a little filtered water) in my Vitamix and then frozen for GGMS. I store the cubes in freezer bags and add one or two to my glass each time I make GGMS. I like to mix things up - so here are a few of my favorite variations of GGMS! Remember, you can add an on-plan sweetener to any of these drinks if desired. GGMS Fruit Punch ~ I use 1 lemon ginger probiotic tea bag, 2 oolong tea bags, 1 black tea bag and 1 green tea bag, plus about 1/3 (of a large pitcher sized) stick of True Lime Black Cherry Limeade Powder and mix in a pitcher. I still add everything from the main recipe, but this one has a sweet, fruity flavor I love! GGMS Cherry Lemonade ~ I make my regular glass of GGMS, and add cherry and lemon extract to taste. Sometimes I'll add an oolong tea bag and a black or green tea bag to make cherry lemon tea, too. GGMS Lemon Mint ~ Make glass of GGMS, then add lemon and mint extract (I only use a tiny drop of mint - it is strong!). Again, tea bags make it even better! GGMS WATERMELON LIME: I use a green tea bag, 2 oolong, and 1 Celestial Seasons Watermelon Lime Zinger, plus the ACV, ginger and a squeeze of fresh lime. SO good! GGMS Coconut Zinger: I found CS Coconut Zinger tea bags at Sprouts this week, so I'm still playing with this. 2 oolong bags, 1 coconut zinger tea bag, ACV, ginger and fresh lime juice. I also added a big splash of Bai5 Molokia Coconut. Really delish! Walmart has some extracts, and also the True Lemon and True Lime drink mixes, so play around and make your own flavors. I'd love to hear your favorites - leave a comment below! That Cherry limeade sounds delish but so does the Lemon mint! Ill have to try them all!!! This looks delicious! 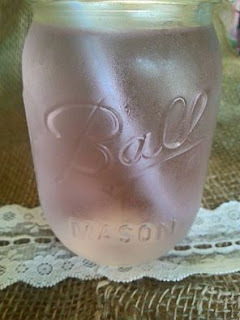 I love the mason jar too.